The Optus 14s Australian Team Championships wrapped up today, with Victoria claiming the Sproule Stephens Trophy for the winning boys’ team and Queensland the Mary Hawton Trophy for the girls’ team champions with a narrow 2-1 win over Victoria. Yesterday’s final round-robin matches and knockout semifinals whittled down the boys teams to the two top seeds, tournament favourites and rivals, New South Wales and Victoria. 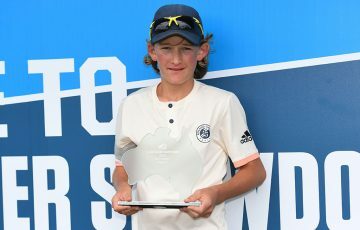 Imposing 14-year-old Daniel Guccione got the locals off to the best of starts in the final, winning his tie in straight sets 6-1 6-3 over Jordan Smith. New South Wales hit back when Matthew Tanza’s perfect run at the Teams Championship continued, winning yet another singles rubber, this time over Omar Jasika 7-6(5) 6-0, sending the tie to a deciding doubles match. Tanza finished with an undefeated singles record over the course of the event. 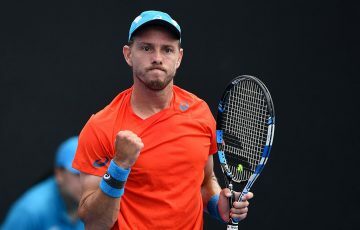 Marc Polmans joined Guccione and the Victorians prevailed in two tight sets, 6-4 6-4, handing the Championships to the home team, after South Australia’s win last year. 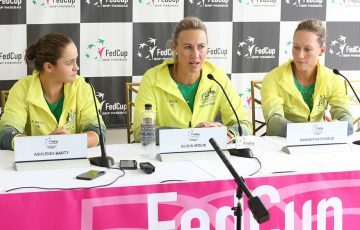 Guccione was pleased with his form over the whole tournament and especially in the final, atoning for his state’s disappointing performance in 2009, where they finished seventh overall. “The whole tournament I’ve been playing pretty well, but today I played unbelievable,” Guccione said. Victorian team captain and relative coaching newcomer Wayne Arthurs was happy with his team’s performance throughout the event. 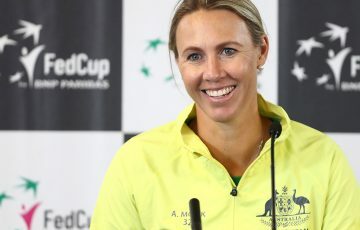 “Being seeded No.2 leading into the tournament, it would have been a bit of a disappointment if we didn’t make the final, it was probably a bit of a bonus that we won,” the former tour professional and Davis Cup representative told tennis.com.au. Arthurs also predicted further success for his young trio, both in this week’s Optus 14s singles and beyond. The weekend rain caused some delays in the girls’ team championships scheduling, meaning that both the semifinals and final were played today. Victoria and Queensland proved their dominance in reaching the final with clean sweeps over New South Wales and South Australia respectively. 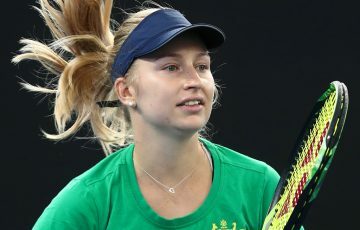 Victoria got off to a good start with Brigitte Beck silencing Jaimee Gilbertson 6-1 6-4 before Naiktha Bains struck back for Queensland with a fighting 4-6 6-4 6-1 victory over Isabelle Wallace. With the tie locked at 1-1 the scene was set for a memorable final rubber showdown in the deciding doubles – and the girls delivered. Beck and Annabelle Andrinopoulos opened up an early lead for Victoria, racing through the first set 6-1. Queensland, however, was not to finished. Bains was joined by Lizette Cabrera and together they worked their way back into the match, taking the second set 6-4. The final set was tight, with the Queenslanders getting over the line 11-9 in the super tiebreak. 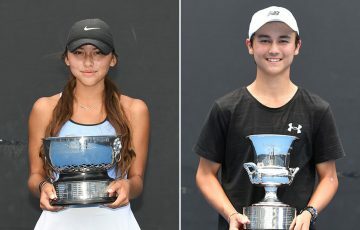 Many of the players to impress will now look for individual success in the Optus 14s singles, which begins on Thursday 2nd December, with qualifying on Wednesday.